I HAVE to tell you about these chocolate molten cakes I made the other day. I made them because I had the urge to bake something and the other option was angel food cake and Ken did not want that. I wasn’t going to be stuck eating an entire angel food cake on my own. Most of my friends at work are still sticking to their New Year’s diets so they wouldn’t have touched the cake with a 10 foot pole. So making 6 little chocolate molten cakes was the option I went with. Do you want to try some? Let’s go get some coffee first because coffee goes really well with it because coffee goes really well with anything that’s baked and chocolatey. I’m not the best baker in the world by any means. I can bake stuff from cookbooks but creating my own baked goods recipe usually results in disaster. This one time, I tried making magic bars from scratch, using a recipe that I made up in my head. I was trying to be a math whiz and calculate ratios and all that fun stuff. Did I tell you math was my favorite subject? Probably not because it totally isn’t. Said attempted recipe was a failure not only once, but twice. So back to the books I go, cookbooks, that is. I got this recipe from the William’s Sonoma Baking Book. The recipe said to top with optional Raspberry Coulis or Creme Anglaise. I don’t think I’ve ever had raspberry coulis and the only Creme Anglaise I’ve ever had was so darn good that I want to keep my memory of it that way. So I made my own option and went with Strawberry Sauce. Said strawberry sauce recipe came from the WS Baking Book as well. These chocolate molten cakes came out of the oven so pretty and puffed up but they undoubtedly sunk in the middle but they’re still a winner in my book. They taste like my favorite thing ever, brownies. And I even made them look pretty for the pictures, too! 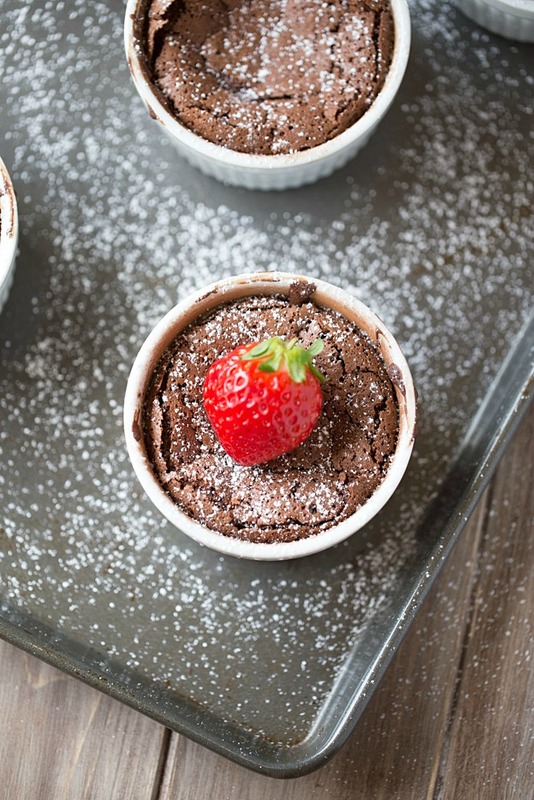 Rich, chocolatey gluten free chocolate cakes are baked in ramekins and topped with homemade strawberry sauce. First, make the strawberry sauce. In a large sauce pan, bring the strawberries, lemon juice and sugar to a boil. Cook while stirring occasionally until the sugar is dissolved and the strawberries are softened, about 3-5 minutes. Remove from the heat and set aside to cool. Preheat your oven to 400 degrees and prep six ¾ C ramekins. To prep the ramekins, spray the insides with cooking spray and then wipe away excess with a paper towel. Then dust each ramekin with a little cocoa powder, enough to coat the bottom and sides (inside). Discard excess cocoa powder into a trash can. Place the prepped ramekins on a baking sheet and set aside. Prepare the batter. Place the chocolate and the butter in double boiler (hint, if you don't have one, like me, you can place a pyrex glass bowl into a sauce pan filled with a small amount of water. Just make sure the glass bowl doesn't touch the bottom of the pan or the water.) and heat over low heat. Stir often until the chocolate and butter are melted and creamy. Then remove from the heat and stir in the vanilla extract and salt. In the bowl of a stand mixer, beat together the egg yolks, 3 tbsp of the granulated sugar and the cocoa powder on medium-high speed. Once incorporated, whisk in the melted chocolate mixture until blended. In a medium sized mixing bowl, beat together the egg whites with a hand mixer over medium-high speed until foamy. Add the remaining 3 tbsp of granulated sugar and beat on high until glossy stiff peaks form. Spoon half of the egg white mixture into the chocolate mixture and whisk until blended. Then add the remaining egg white mixture to the chocolate mixture and stir gently until combined. Divide the batter evenly among each ramekin. Bake at 400 for about 13 minutes, or until the tops are puffed and cracked. Remove from the oven and serve with the strawberry sauce, if desired. The original recipe calls for dutch process cocoa powder. If you have that, use it. If not, whisk together 3 tbsp of regular cocoa powder with ⅛ tsp baking soda. Use 2 tbsp of that mixture in the recipe. Store the rest in an air-tight container. You can store uneaten cakes on the countertop, covered with plastic wrap. Store the strawberry sauce in a refrigerator for 3-4 days. Adapted from William's Sonoma Baking Book. For more recipes, style and travel ideas, follow me around the web! While I like angel food cake, I totally approve of your opinion – these chocolate cakes are way more satisfying! I want your Valentine to make them for you too, Beth. You will totally LOVE them! I absolutely adore molten cakes, Julie! This one looks fantastic! 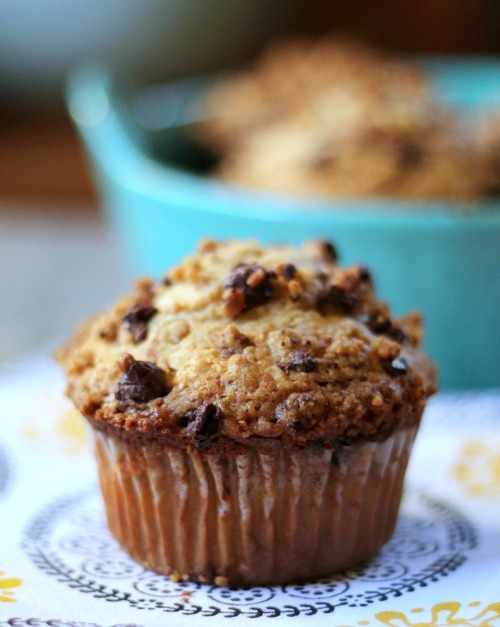 I could seriously eat this for breakfast right now. And your presentation is gorgeous! Pinned! 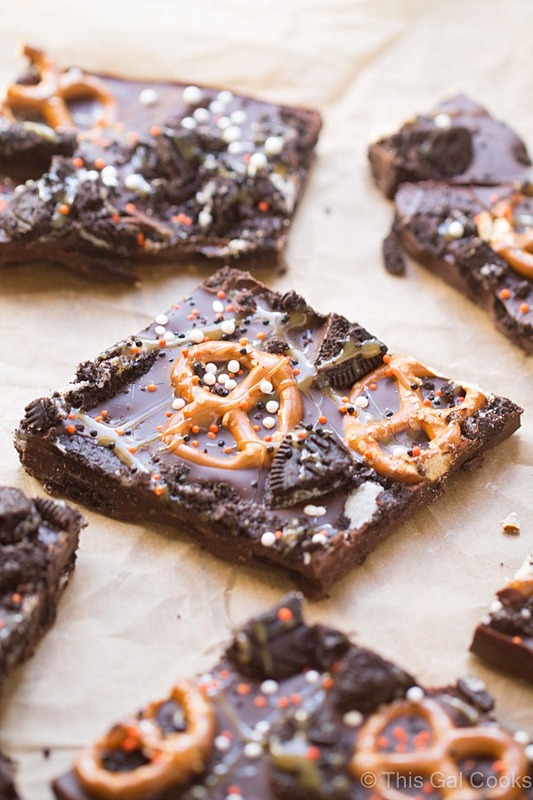 I don’t blame you – I could totally eat this for breakfast, lunch and dinner! These look so perfect for Valentine’s Day! That strawberry sauce looks to die for! Thanks Taylor! The strawberry sauce is to die for! My daughter has been begging me to make something like this! Looks perfect for VDay! You should make them for her, Julie! Perfect VDay treat to share with the family! 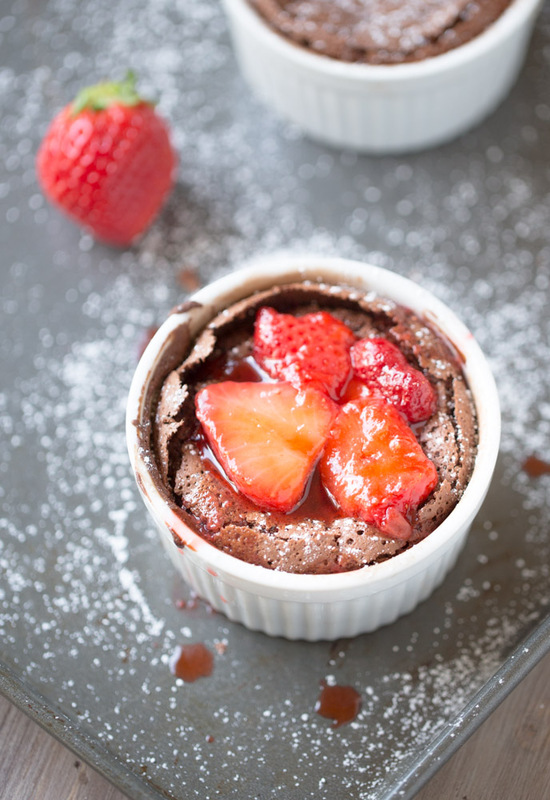 These molten cakes look perfect! I love the crispy top and that strawberry sauce sounds amazing! Thank you, Ashley! The strawberry sauce is amazing, drinkable, really! Aw you should totally make these cakes one day, Ilona! sounds like we are the same page with the lava cake and fresh fruit girl… great minds think alike! I pretty much could just faceplant in anything that is chocolate! What a perfect little dessert! Although I’ll admit, I think I would’ve finished all of them myself! 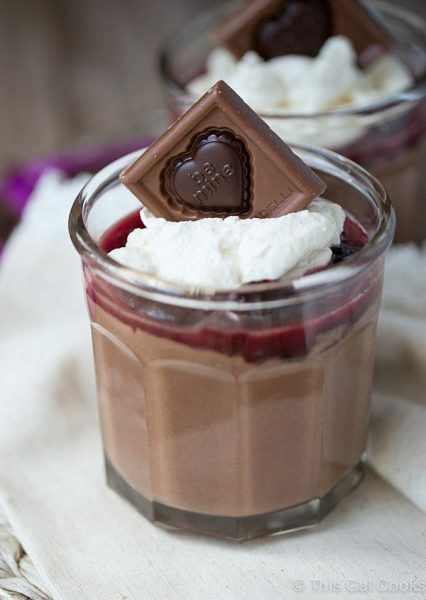 Mmmmmm I think I just found my Valentine’s Day Dessert to make!! This is a great choice! Hope you enjoy them as much as I did if you give them a try, Tammi! These look incredible! Love the strawberry sauce! They are perfect for Valentine’s Day! They sure are, Kelly! Thanks so much for stopping by! 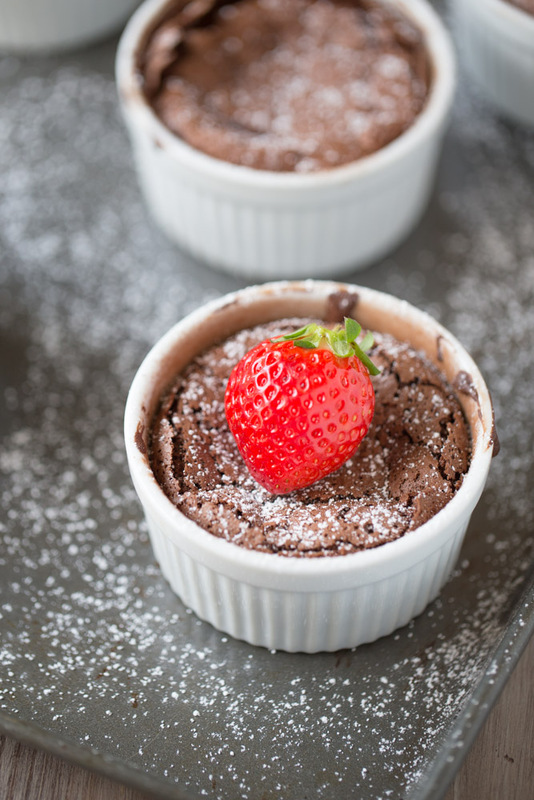 Nothing says it’s Valentine’s Day than a classic chocolate molten cake. These are perfect! 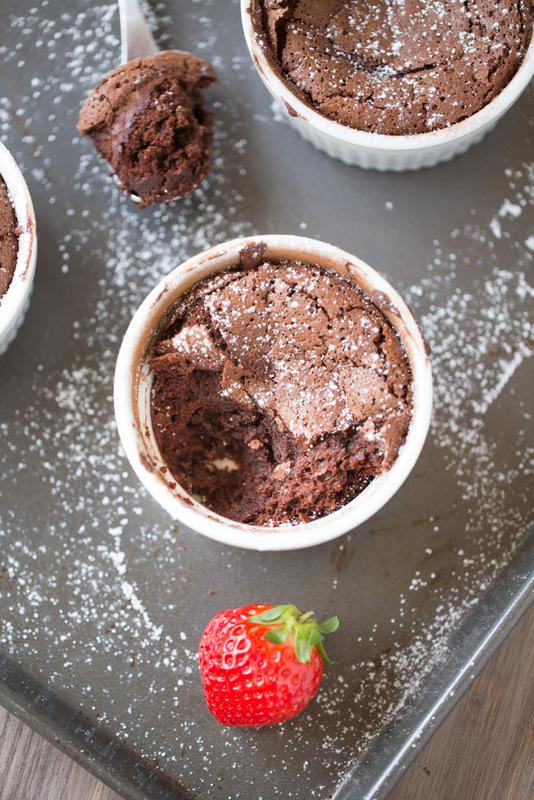 Molten chocolate cake is the most perfect Valentine’s dessert ever. I totally want one. And if you still want to make that angel food cake, you can go ahead and send it to me. I’ll eat it for you. Ok, you’ve gotta deal, Amanda! It looks like you mastered these!!! Baking is a science and cooking is an art… or that’s what a professor in college always told us when we were trying to experiment in the kitchen! Yes! I think that sums it up pretty well. Cooking, yes, I can make stuff up and it will work. But baking, gah! Love chocolate molten cakes! Yours look perfect! I’ll help you polish off one of those cakes! They look beautiful! RIght there with you about baking – I can do it from cook books – but off the top of my head? and math? and science! My brain totally farts. PS, I ate three of those cakes and it was totally worth it! Oh yes, definitely a great weekend treat, especially for a holiday weekend! I love these babies. I have never tried to make them. It looks like you had a SUCCESS. Good for you. Yes, definitely we needed to get the coffee first. Thanks Carol! You really should give them a try. And yes, coffee first, for sure! You’re probably right – although, I did get a Grand Marnier soufflé at this to die for restaurant and it stayed nice and puffy. BUT, I’m pretty sure a pastry chef baked it! But I’ll take them puffy or not. Especially with stuff drizzled on top! Thanks for stopping by, Mary Frances. Hope you had a great weekend. The idea of a lava cake is to have lava. Yours doesn’t. It’s kind of just a brownie in a ramekin. But thanks for the small sauce recipe.